Somerville, Mass. police have released a photo of the male person of interest, asking for help identifying him. A man accused of urinating on four American flags at Somerville Veterans Memorial Cemetery earlier this month has turned himself in to police. According to the Somerville Police Department, the man went to Somerville District Court Wednesday to turn himself in. Last week, police said they were filing charges against the man. 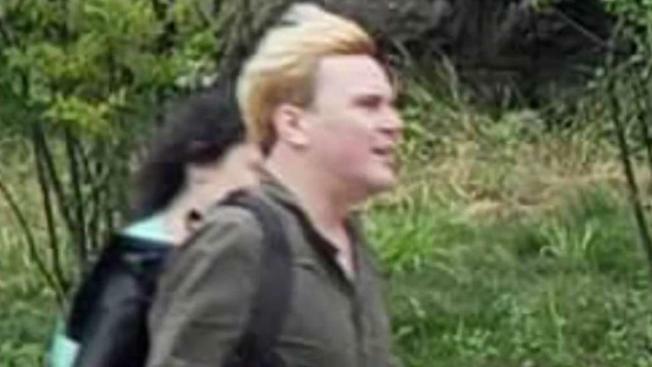 Police have not released the suspect's name, but the Boston Globe identified him last week as 31-year-old Michael C. Lacey of Boston. The suspect was wanted on charges of defacement of an American veteran's grave marker, open and gross lewdness and disturbing the peace. The incident allegedly occurred on Sept. 10 and was captured by George Gatteny, who posted photos of the flags, Lacey, and a woman he was with on Facebook afterward. Gatteny told NBC10 Boston he was sitting in traffic on Broadway in Somerville when he saw a man pull four miniature American flags from the ground with a woman acting as a lookout. "Never imagined what I was about to see," Gatteny said. He said the man then threw the flags behind a statue and urinated on them. When he got out of his car and confronted the pair, Gatteny said they fled the area. "They were walking, talking, as if nothing happened," said Gatteny. According to Somerville Veterans Services, the cemetery contains remains of soldiers killed in World War II, the Korean War, the Vietnam War and the 1983 Beirut bombing.